It can be easy to forget that worlds don't wait for heroes before they begin. It can be easy to forget that things happened before the lights came up and the story started. This is one of those things that happened: this is one of those tales that slipped through the cracks. It is the story of a girl named Elizabeth, and a girl named Annie, and what they were to one another, in the sight and sounding of the sea. Maybe it isn't fair. But fairy tales never really are. In Sea-Salt Tears is a free short story that can be downloaded from Seanan McGuire's website, events actually occur before the first book but one of the main characters isn't introduced until One Salt Sea so I'd recommend waiting until after you read that book before you start this so you can avoid spoilers later on. 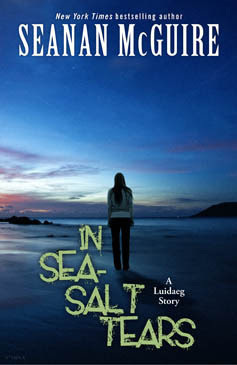 If you've already read One Salt Sea then you'll already be familiar with the connection between the Luidaeg and the selkies and why they aren't on the best of terms, what you won't be familiar with is the personal history between Elizabeth and Annie and how that added a whole extra layer of complicated between them. Seanan McGuire always manages to pack a punch in her short stories, I don't know how she does it but she always makes me care about her characters no matter how short a time we spend with them and I was totally invested in Annie and Elizabeth's relationship even though I knew going in that it didn't all end in sunshine and rainbows. This was a really sweet romance, one that developed between two lonely and desperate girls who were both looking for friendship and someone to turn to when their lives weren't going to plan. It was heartbreaking to see it all fall apart and that is made even worse when you think about the huge debt between the selkies and the Luidaeg, a debt that large is going to be impossible to pay but a promise is a promise and something is going to have to change soon.